Together We Stand (or ‘together we run around’ if you were on the DDN team on the day!) was a lively, fun, vibrant day in Birmingham – the gathering of a growing family from all areas of service user involvement. This year, as always, we witnessed diverse viewpoints being listened to with respect and areas of differing opinion being debated constructively. There were more group gatherings and special interest meetings than ever before – a sign that there’s plenty of solidarity in the field of user involvement, both through traditional activism relating to user rights and in the newer recovery movement – and even a meeting on finding common ground. There were lively sessions that could plant the seeds for change – a discussion that showed a wider naloxone roll-out could be getting closer, a constructive forum to change the doctor/patient relationship for the better, a call to respond to the needs of older users, and evidence of inspiring recovery groups. With these sessions, as with so many of the positive messages from the conference, the work needs to go beyond the event. Shout it loud – service user involvement is alive and well in all its many colours. We’ve reported on snapshots of many different elements in this special issue of DDN. Give us your feedback, tell us of anything we should have noticed, and be proud to have contributed to a movement that’s an ongoing force to be reckoned with. Full report from the fifth national serice user involvement conference, includes coverage of the main sessions and workshops, interviews, vox pops and much more. 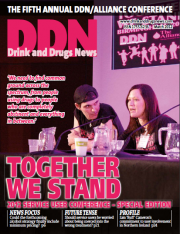 Could the government’s forthcoming alcohol strategy finally include minimum pricing, asks DDN. Release solicitor Kirstie Douse answers your legal questions, and Dr Chris Ford urdges not to forget mental health in people who drink,. A punitive CQC signalled the end of our well-respected rehab service, says John Jotcham.